This Holiday Caravan is 38 feet long and 12 feet wide. Hello and welcome to Dreamers Getaway, our beautiful, spacious luxury holiday home, set in an open woodland plot, with everything for your perfect getaway! Here, on site at the Wild Duck holiday park there's a host of fun things to do with Indoor swimming pool & toddler pool, seasonal outdoor swimming pool, sand volleyball area, multi sports court, 2 children's play areas, children's clubs, Sitting Duck restaurant and bar with FREE Wif accessi, TV's often showing the big sports fixtures, Live Lounge evening entertainment, an on site shop, fish & chip shop, bike & go kart hire shop, mini golf, amusement arcade and much more. Seasonal activities such as Park Ranger tours, archery and In Pool water sports are bookable on site. All these facilities are within a few minutes of the caravan. You can enjoy walks or cycling or just relax in the peace of your surroundings watching the wild birds and rabbits, the antics of the squirrels, or maybe a duck bringing her brood along to show them off! 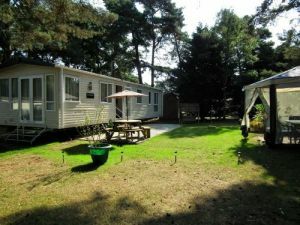 Relax on the wooden garden swing, dine outdoors at the solid wooden picnic table bench or under the gazebo, after a day out discovering the wonders of the Norfolk Broads, a day at the beach or a visit to one of the many animal/adventure parks in the area. Are your dates available? Check this caravans availability calendar - (opens in a new window) or use the contact details below to check the availability direct with the owner of this caravan. Rates are per week for the rental of the holiday home, not per person. Additional cleaning fee of £40 for stays of 3 nights and less. Refundable security deposit of £50 is required. Arrival/Departure days are accepted any day of the week. This listing for a privately owned static caravan rental has been viewed 21520 times.